Sydney Shop Girl: The Food, the People and the Colours of A Singapore Wedding. 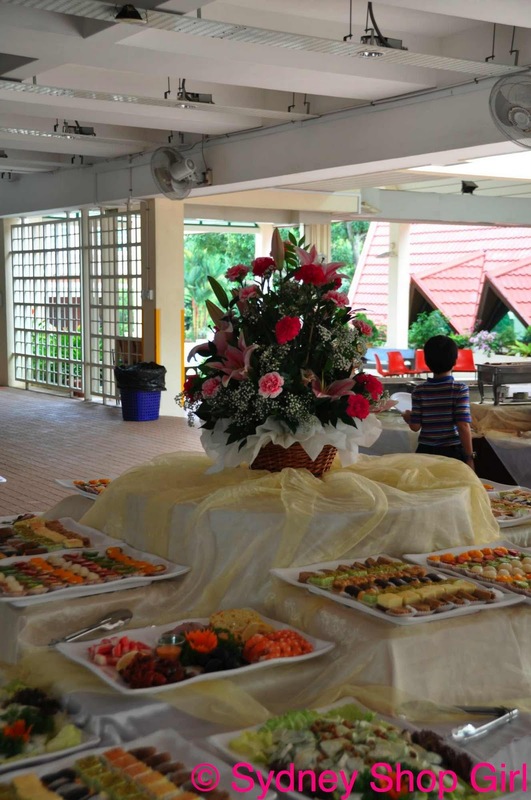 The Food, the People and the Colours of A Singapore Wedding. 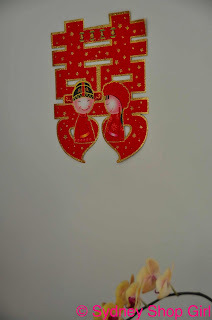 Chinese weddings are an all day affair of food, colour, love, family, laughter and the occasional tear. 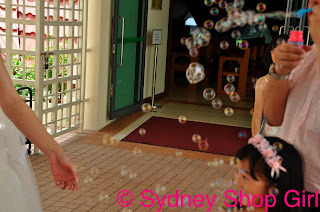 I know this is true of weddings of all cultures but today I thought I'd share some photos I took at my cousin's wedding in Singapore last weekend. I thoroughly enjoyed my role as unofficial family photographer. What I didn't have in professional experience and equipment, I made up with in number of photos and some crafty editing. I had about exactly 379 photos and I've burned 4 discs to mail back to my aunty. Not a bad effort for a photographer clad in 10 cm heels and melting makeup!! There was beautiful natural light on the day and the contrast of vivid traditional colours of Chinese tradition worked well with the black and white of a Western wedding. The day starts early with the tea ceremony at the groom's house. 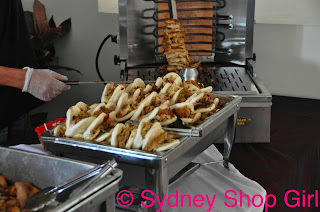 And just the beginning of the day's food. The humidity got the better of me. The first photo of the day outside of air conditioning. The bride arrives at and she is lead into the house by one of her brothers. 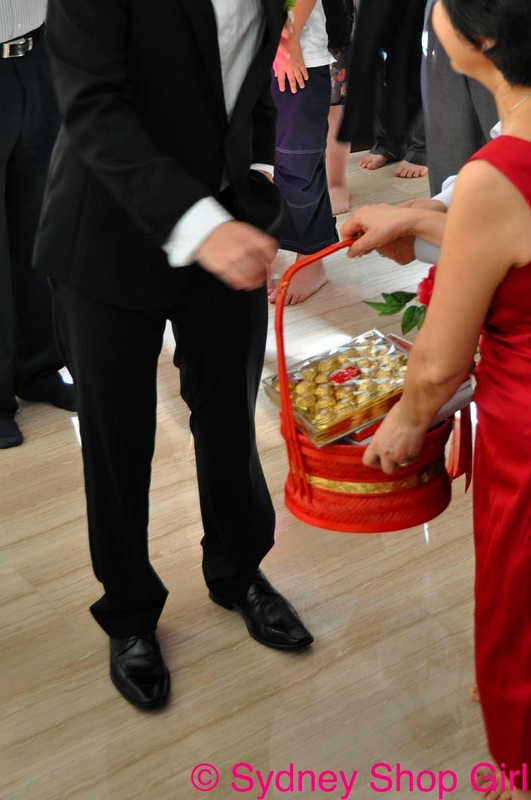 Gifts from the bride's family are given to the mother of the groom. For the tea ceremony, the bride and groom offer tea to their relatives. 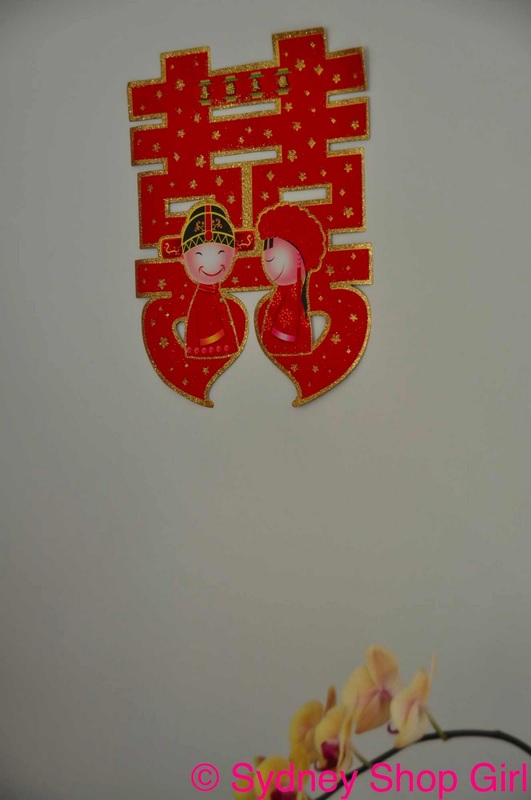 In return, the relatives offer gifts of money in red packets. 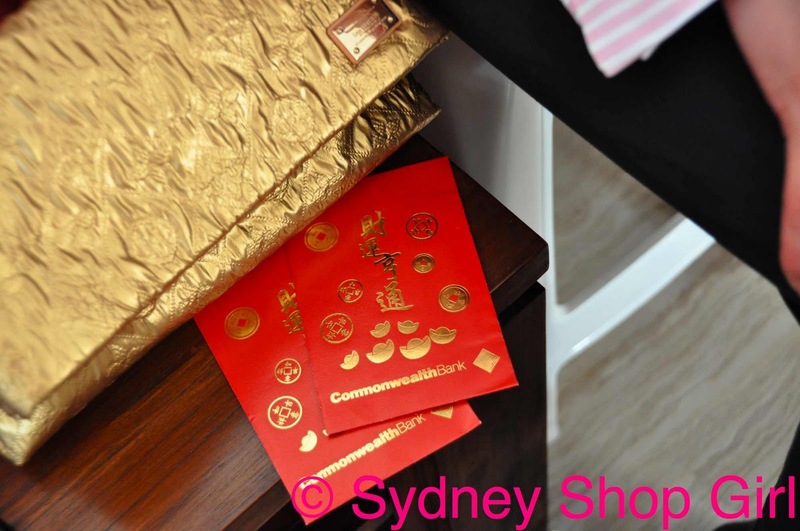 Mr SSG and our trusty CBA red packets waiting for our turn. 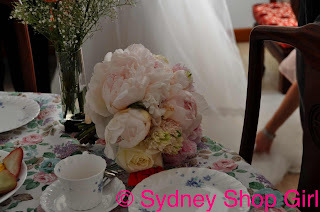 The bridal bouquet at the tea table. 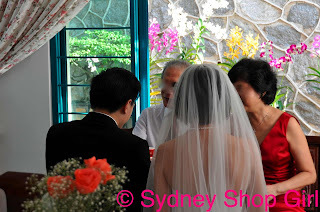 Part of the customs include the bride having tea at the house of the groom's family. 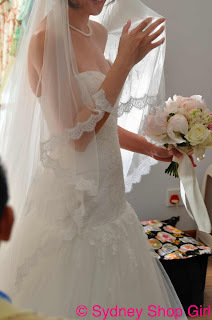 She has to keep her veil over her face whilst eating. The tea ceremony begins with the parents of the groom. 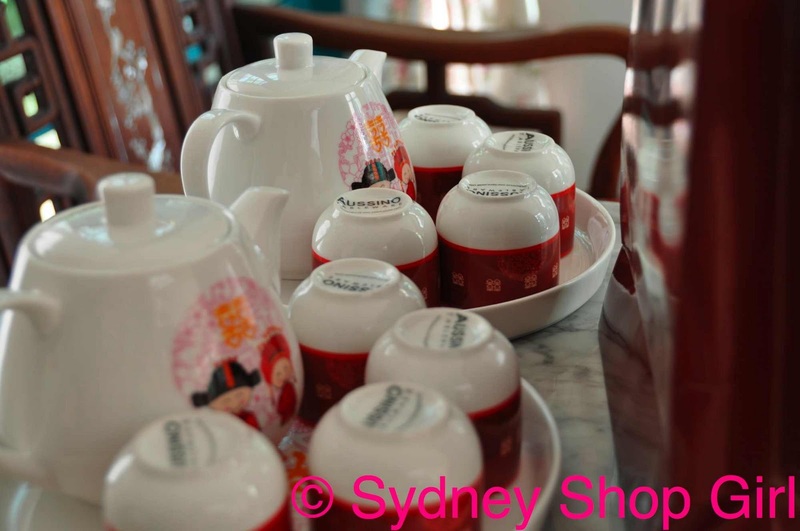 There is a particular order for relatives in the tea ceremony. Due to family size, it is often best to have the list written down and one person to call out whose turn it is next. 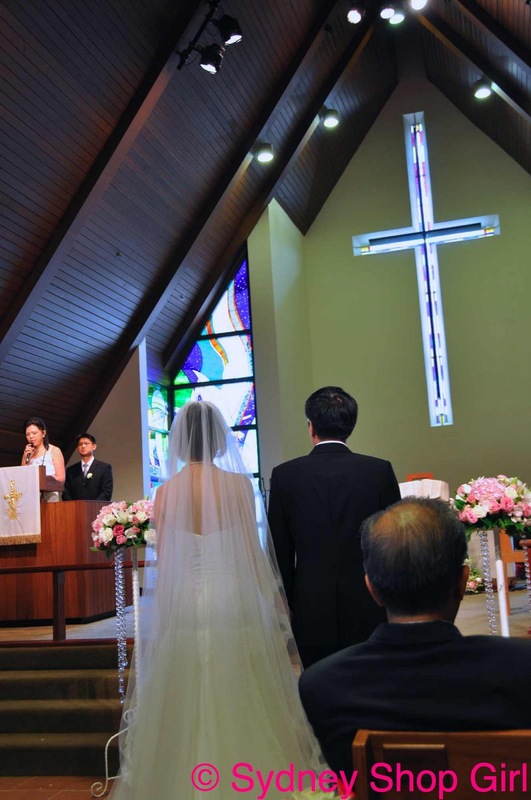 Many couples also have a church wedding in the accordance with their own religion. 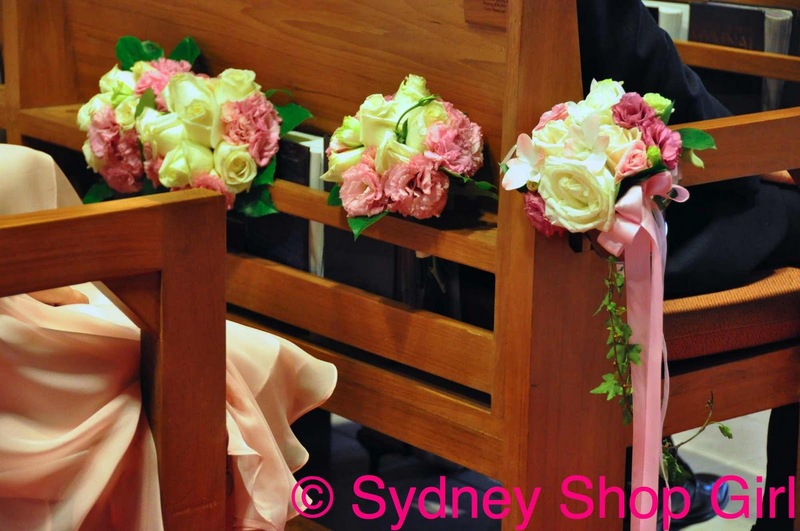 Weddings are filled with special moments and memories for all who attend. For those already married, the ceremony brings back memories of their own day, all those years ago. Those who aren't married have a great day of it getting dressed up and reconnecting with friends. How many great outfits have you bought on account of being invited to a wedding? For the children and their parents, there are moments of fun. 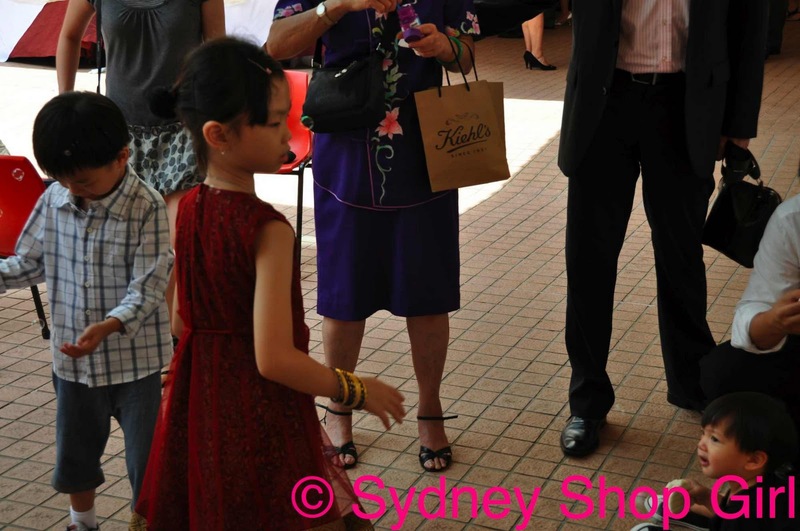 Generations interact with each other in the day's celebrations. 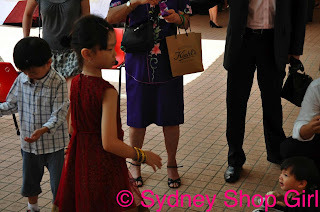 That's my mum blowing bubbles with the Kiehl's haul from Sydney at the ready. And more food. 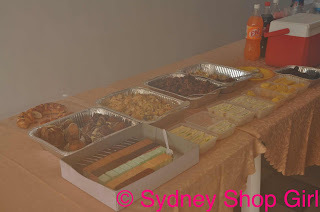 A 'light' lunch after the ceremony, before the evening's 'proper' reception. 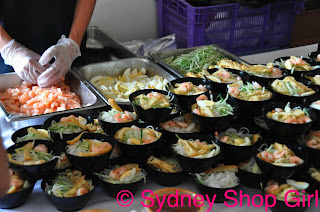 Individual serves of laksa, ready to go. Little girls all over the world love pink, princess, ballerina and flowers in that order. This is one of my adorable nieces. Her mother was telling me that both her daughters have vast wardrobes of 'princess' gear which is the standard dress code for birthday parties. 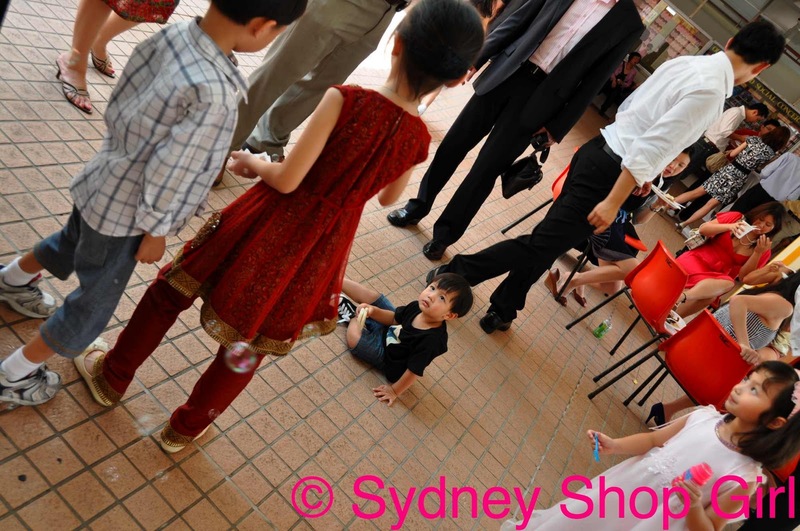 The Suri Cruise heeled slippers and pedicure look is also popular with the pre school set in Singapore. The dinner reception was lovely too. The bride had such beautiful gowns to change into during the course of the evening. 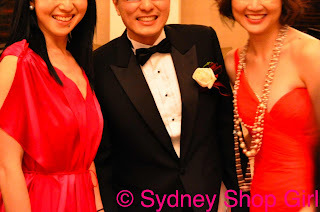 Me in the pink Stella McCartney for Target dress with the bride and groom. Have a lovely weekend, everyone! I'm going to make a dent in my Christmas shopping, catch up on some sleep and get to yoga both days. Such gorgeous photos. The food in particular looks amazing. Love the Target Stella dress. Beautiful colour. 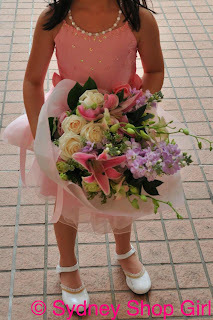 your blog is very beautiful and attractive. you have also a great collection of wedding pictures. Thank you all. I am bravely trying to introduce more colour to my wardrobe.